Founded in 1903 at the corner of Second and Lee streets in Alexandria, Louisiana, Rapides Regional Medical Center represents a proud heritage of compassionate healthcare services coupled with the most advanced technology of the day. With a continued emphasis on progressive care, Rapides Regional Medical Center has grown to meet the continually changing needs of our patients and the rapidly advancing technology of modern healthcare. Located in downtown Alexandria and easily accessible from Interstate 49, the hospital is licensed for 364 beds and fully accredited by The Joint Commission. The hospital participates in the Medicare, Medicaid and Champus programs as well as a number of commercial insurance and managed care programs. 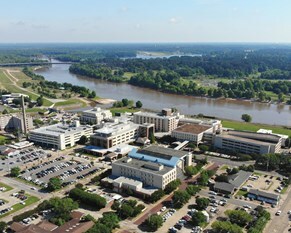 Rapides Regional Medical Center offers a wide array of services including general medicine, general surgery, cardiovascular surgery, bypass surgery, cardiac rehabilitation, neurology, neurosurgery, intensive care and telemetry, oncology services, obstetrics and gynecology, orthopaedic services, physical therapy, skilled nursing services, respiratory therapy, lithotripsy and various outpatient services. At the beginning of 2012, Rapides Regional Medical Center became the first verified Level II Trauma Center in Louisiana. The medical staff includes physicians in more than 30 medical specialties. Rapides Regional Medical Center set a shining example by becoming a three-time winner of the Louisiana Quality Award. This award honors businesses and organizations that are leaders in the pursuit of quality and service. Rapides Regional Medical Center was also honored by being named one of the nation's "100 Top Hospitals - Benchmarks for Success." The annual study lists hospitals based on quality, operations and financial management. In addition, we operate the area’s first Certified Stroke Center, offering comprehensive stroke care from the minute a patient walks through our door to the time they go home. Plus we are the only accredited, Cycle III Chest Pain Center in Central Louisiana.